It is important to note that micro-hydro involves a large range of system sizes, from a 50 watt system powering an electric fence to a 100 kW system selling significant quantities of electricity to a utility. Like other renewable energy technologies, micro-hydro can be used as either a grid-connected or a battery-based, off-grid system. This module focuses on micro-hydro systems that are designed to offset home or farm/ranch energy consumption, not the sale of electricity for profit. If you have an interest in larger systems designed to sell electricity for enhanced revenue, please contact your Montana or Wyoming Cooperative Extension Service. Micro-hydropower resources are also divided into two categories: low-head and high-head systems. Head is a measure of the vertical distance that water falls. Low-head is generally considered anything between 3-40 feet. Obviously, the higher the head, the greater the available energy, so low-head systems generally require more available water (flow) than high-head systems to generate the same amount of energy. The difference will be further discussed in Section 2: Site Assessment. All hydroelectric electric systems are further categorized as impoundment or run-of-the-river systems. Impoundment systems store water for the hydroelectric system. Larger systems typically use this method, as flow can be regulated and maintained at a more consistent level throughout the year. Unless an impoundment already exists for activities such as irrigation, most micro-hydro systems will be run-of-the-river where water is simply diverted from a stream or canal. Run-of-the-river systems typically have much less impact on wildlife habitat, fish passage, water flow, and water quality than impoundment hydroelectric systems. All hydroelectric systems are designed to extract energy from falling water, regardless of the size of the installation. The figure on the left shows the basic components of a system. The intake is typically shielded with a trash rack, weir, or forebay to prevent debris from entering the pipeline. 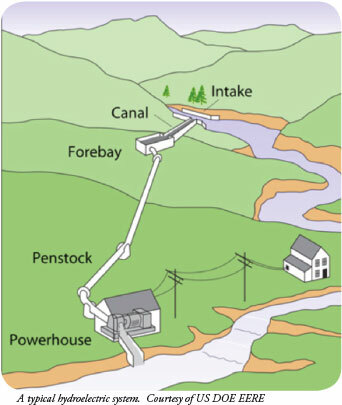 The pipeline (penstock) carries water under pressure to the turbine (powerhouse), where the energy of the flowing water is converted to electricity. The turbine for a micro-hydro system operates in much the same manner as a wind generator. The “wild” AC power is sent to an inverter, from which standard 110/220 volt, 60 hertz electricity emerges that would commonly be used in homes or other electrical loads. In essence, a micro hydro systems works just like a wind turbine, except it extracts energy from a denser fluid (water) than a wind turbine (air)! Only a lucky few farmers, ranchers, or homeowners will have access to a quality, micro-hydro resource. Hydroelectric resources are much more site specific and concentrated than solar or even wind energy. Naturally flowing streams, irrigation ditches, and existing pipelines are the most likely locations for a micro-hydro system. Obviously, if you do not have flowing water on your property, then micro-hydro is not for you. For those who have access to the resource flowing water, micro-hydropower can often be the lowest cost source of renewable energy available, so it should not be overlooked. More information on site assessment, selecting equipment, regulatory considerations, cost, and incentives is presented in the following sections. Davis, Scott. Microhydro: Clean Power from Water. New Society Publishing. Canada: 2003. Idaho National Laboratory. Hydropower Program. Available at http://hydropower.inel.gov/. Kindberg, Leif. Micro-Hydro Power: A Beginners Guide to Design and Installation. National Sustainable Agriculture Information Service. February 2011. Available at http://attra.ncat.org/attra-pub/farm_energy/hydropower.html. Northeast Regional Agricultural Engineering Service – University of West Virginia Cooperative Extension Service. Small Hydroelectric Plants. EPP-13.ON: FS 13: 1978. Available at http://www.wvu.edu/~exten/infores/pubs/ageng/epp13.pdf. United States Department of Energy: Energy Efficiency and Renewable Energy. Small Hydropower Systems. DOE/GO-102001-1173: July 2001.